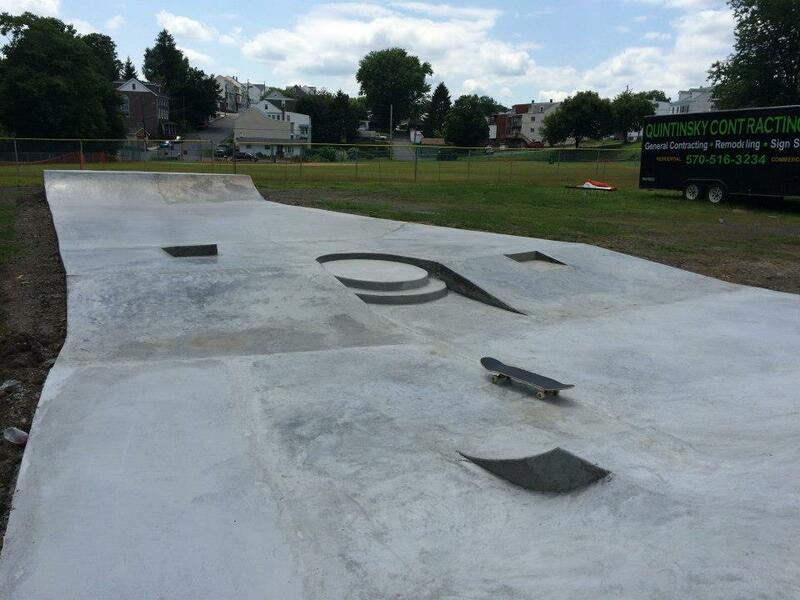 The Minersville skate park committee contacted Arment Concrete when their frustrations grew trying to raise funds for a full scale park at a cost of $100,000. We were able to work with their funding and build a small (2,200 sq ft) park for under $30,000. In recent years, we have returned to complete several additions; rails, ledges, bowl corner and embankments as additional funds have been raised. These additions continue to improve the park and hold interest for the users. In the beautiful hills of eastern Pennsylvania, grandparents sought a local, safe creative space for their grandson and contracted Arment Concrete to design and build a 2,000 square foot skate park that utilized the lay of the land in a wooded space on top of their property. The design featured a small raised bowl with no coping that served as a learning space and spilled into the basin area that held a variety of transitions, embankments and a small stair set. Arment Concrete was contracted as a consultant construction manager for the second phase of this project. After being involved with project managing and design for the process leading up to the second construction phase, the committee involved with the project decided that it would be best for a local expert, experienced skate park specialist to finish out the second construction phase. Arment Concrete was hired to successfully complete the construction of Phase Two. In the aftermath of 2012 flooding of the Susquehanna River, the town of Bloomsburg was left without a skate park when the rising river waters swept their ramps down stream. The funding allowance was steering them in the direction of modular ramps but fear of a similar flood situation led them in the direction of concrete. Working with the committee, we were able to aid in the design of a first phase build that was intended to “have a little bit of something for everyone”. We incorporated some different degree of ledge terrain along with a variety of transitions. This build is fundamental on its own, giving a hassle free, safe environment for users. We are currently working with the park committee on the design of phases 2 and three. Public design meetings are in the works and input from the current users will again be the basis for the park’s future. Arment Concrete was contracted as a construction consultant to help finish a phase one build for a public skate park involved with the Skate-able City Initiative in Philadelphia. McCreesh is a small-build skate park that is in the Philadelphia public park system. Sitting next to a public basketball court, the skate park was designed by Jesse Clayton to be a multi-functional park that was complimentary to the environment surrounding it. Working with a local non- profit and Philadelphia Parks and Rec., we were able to keep the project in budget and within its projected timeline. The Parksburg Point is a faith based youth center that offers constructive programs to the youth in the surrounding area. 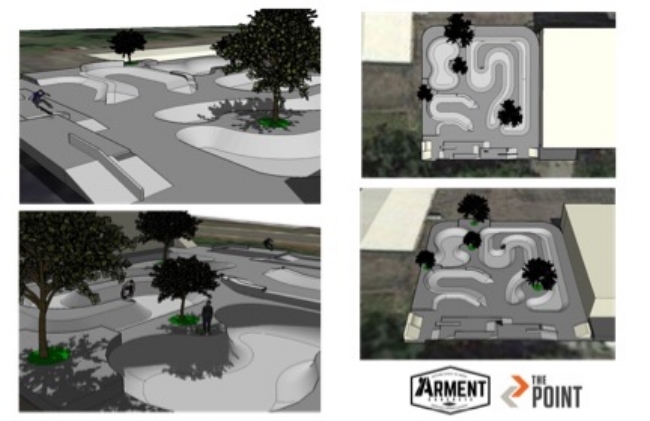 Arment Concrete was approached by the staff to help design and construct a facility that would attract skaters and offer a healthy alternative to what the streets may have in store. This design incorporates several different styles of terrain, while appealing and engaging to many different levels of skill. This 480 square foot mini ramp (3.5’ high, 16’ wide, 7’ transitions) looks like modern art in the wilderness. We stained the concrete to blend in with the natural surrounding and placed ceramic tile under the coping for skate board nostalgia sake. With limited fill options, the cantilever decks provide a mass alternative while giving users the needed vantage point. Working again with the Philadelphia Parks and Recreation department, Arment Concrete was contracted to demo an existing hockey rink which was no longer useable and facilitate the construction of the 4,000 square foot skate facility. Urban development group Skate Philly aided in construction management and provided a design by Jesse Clayton. This space has an intermediate flow with a granite ledge salvaged from the world renowned, now defunct Love Park. A progressive project that started over 20 years ago, the current Denver skate park is a mix of fabricated ramps and concrete. As the original surface decayed, concrete was poured in its place with modern concrete skate terrain to match. As more funds were raised the process continued. Today we see the park ½ completed as fund raisers take place at the park which shows our progress and use of funds. 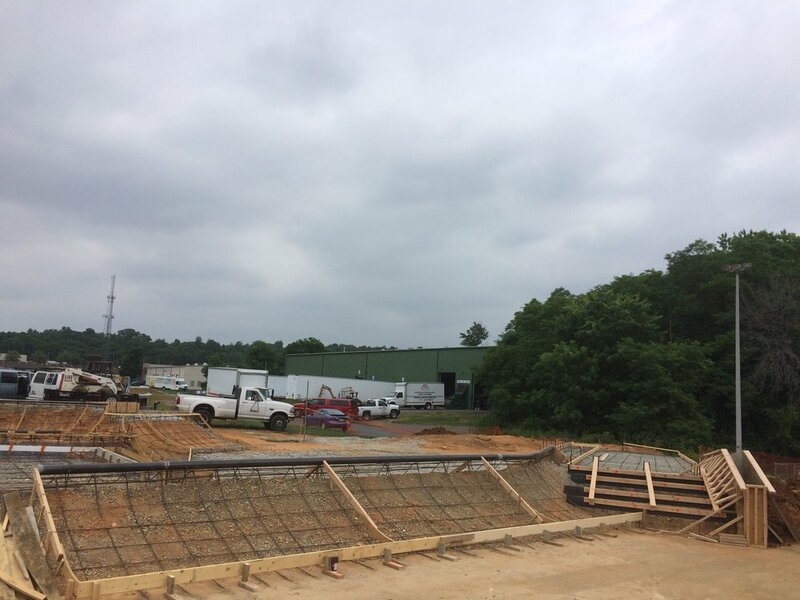 Arment Concrete was able to successfully design and build Dauphin County’s first public skate park with the generous involvement of the community. Public design meetings were held at the local skate shop, support given by the local authorities and funds raised by the local government through tourism grants. Built in the area of sport courts no longer useable, this 12,000 square foot skate park is spacious with general flow ability, mixing plaza and transitional style skating. The Steelton community support was paramount in showcasing the positive affect that a skate park can have in an urban environment.